Identification: Colour is dark reddish brown with noticeable purple shade changing to almost black from the top of the head to the tip of the nose. The shoulders, upper parts of front and back legs and thighs are almost black. The distal parts of the legs are yellow brown. 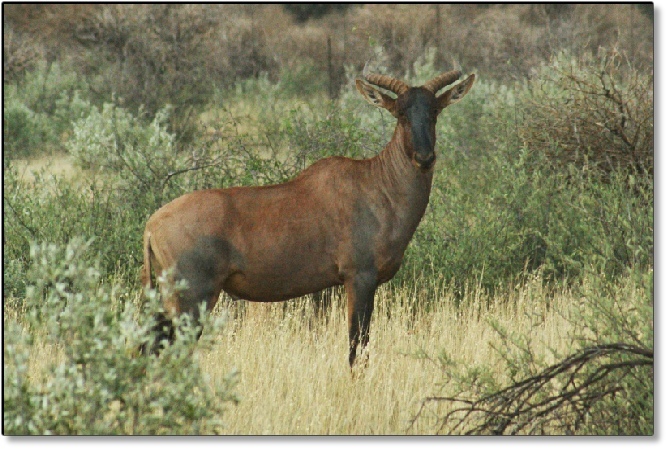 In Central Africa a subspecies of Tsessebe is found known as the Topi. Size: Shoulder height 1,2m; weight - 126-140kg. Habits: Graze in groups during the day, they prefer long grass of +/- 60cm. Territorial behavior. They have pre-orbital glands for marking of territories. Calving season October to December. Distribution: Botswana, Namibia, Zimbabwe and South Africa. 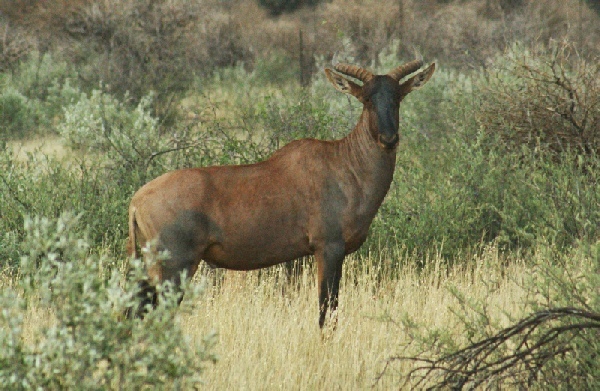 The Tsessebe males and females are similar in appearance, except for thicker horns on the bulls and reproductive organs under the belly (Bulls). The Tsessebe is an ideal choice as an initial wildlife investment as it is an affordable species while providing a good return on investment.